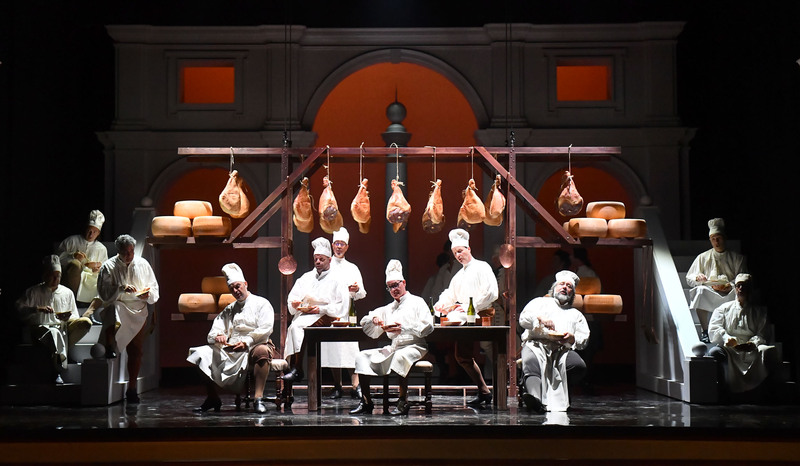 This massive success of Nabucco practically stems from one, just four-minute fragment – the most famous chorus in opera’s history – “Va, pensiero”. 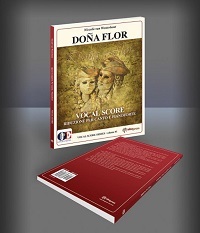 Intoned against the background of a conventionally simplified orchestral accompaniment, thanks to its moving melody that is sung – unusually for a chorus, though extremely symbolic – in one voice (in unison), this song of Hebrew slaves quickly became the unofficial anthem of the Italians. 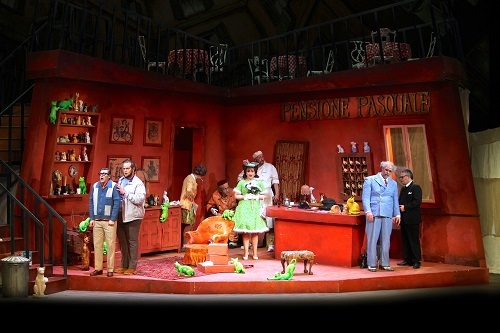 Marek Weiss’s clever staging, embedded in a hieratic space created by the greatest talent in the history of Polish opera design, the late Andrzej Kreutz Majewski, has been performed in Warsaw for over 22 years and invariably draws crowds of admirers hungry for beautiful singing backed by equally attractive tableaux. The Israelites pray as the Babylonian army advances on their city (Gli arredi festivi giù cadano infranti / “Throw down and destroy all festive decorations”). The High Priest Zaccaria tells the people not to despair but to trust in God (D’Egitto là su i lidi / “On the shores of Egypt He saved the life of Moses”). The presence of a hostage, Fenena, younger daughter of Nabucco, King of Babylon, may yet secure peace (Come notte a sol fulgente / “Like darkness before the sun”). Zaccaria entrusts Fenena to Ismaele, nephew of the King of Jerusalem and a former envoy to Babylon. Left alone, Fenena and Ismaele recall how they fell in love when Ismaele was held prisoner by the Babylonians, and how Fenena helped him to escape to Israel. 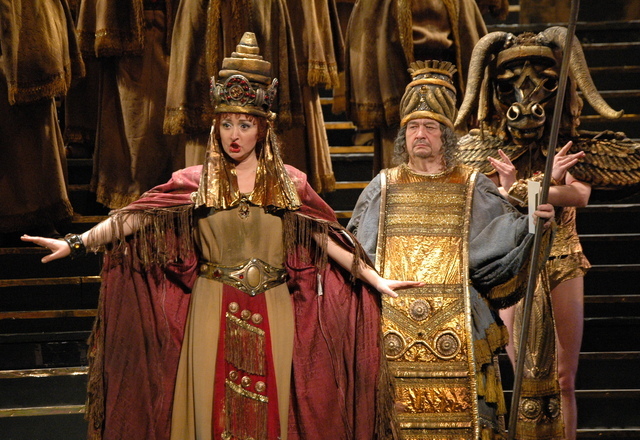 Nabucco’s supposed elder daughter, Abigaille, enters the temple with Babylonian soldiers in disguise. She, too, loves Ismaele. Discovering the lovers, she threatens Ismaele: if he does not give up Fenena, Abigaille will accuse her of treason. 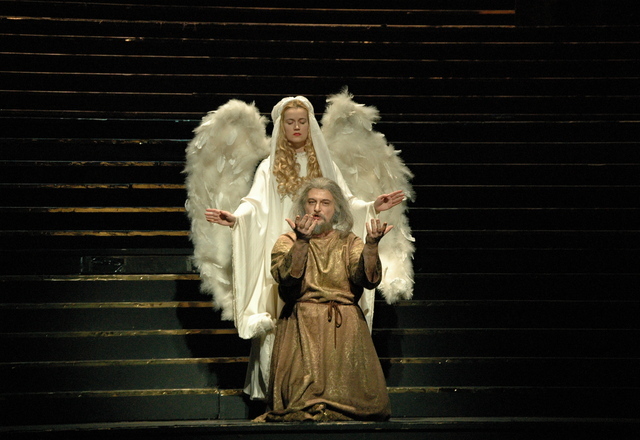 If Ismaele returns Abigaille’s love, however, Abigaille will petition Nabucco on the Israelites’ behalf. Ismaele tells Abigaille that he cannot love her and she vows revenge. 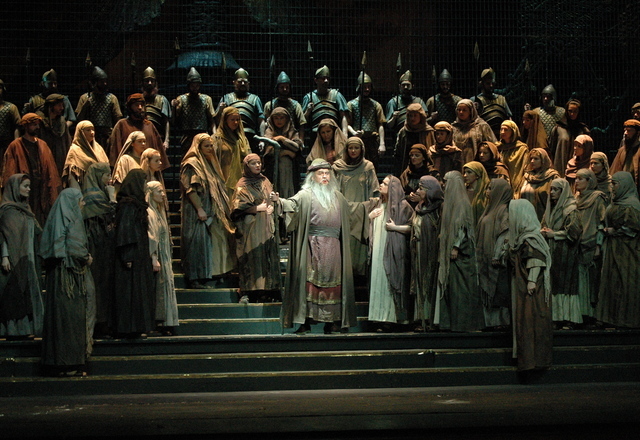 Nabucco enters with his warriors (Viva Nabucco / “Long live Nabucco”). 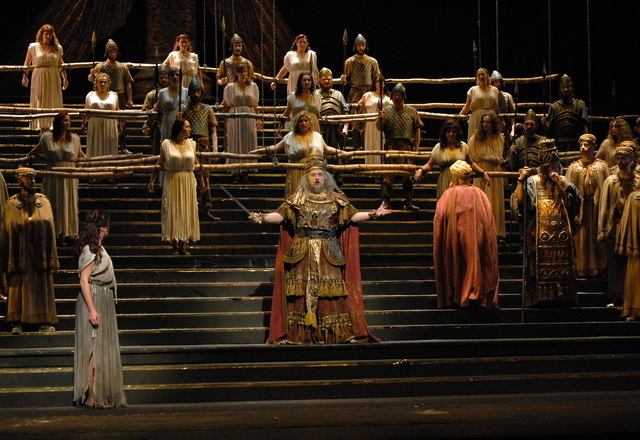 Zaccaria defies him, threatening to kill Fenena if Nabucco attacks the temple. 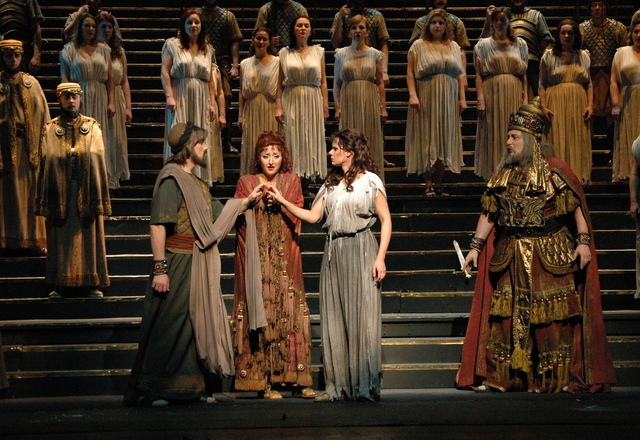 Ismaele intervenes to save Fenena, which removes any impediment from Nabucco destroying the temple. He orders this, while Zaccaria and the Israelites curse Ismaele as a traitor. Nabucco has appointed Fenena regent and guardian of the Israelite prisoners, while he continues the battle against the Israelites. Abigaille has discovered a document that proves she is not Nabucco’s real daughter, but the daughter of slaves. 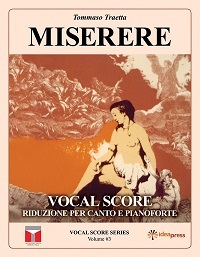 She reflects bitterly on Nabucco’s refusal to allow her to play a role in the war with the Israelites and recalls past happiness (Anch’io dischiuso un giorno / “I too once opened my heart to happiness”). The High Priest of Baal informs Abigaille that Fenena has released the Israelite captives. He plans for Abigaille to become ruler of Babylon, and with this intention has spread the rumour that Nabucco has died in battle. 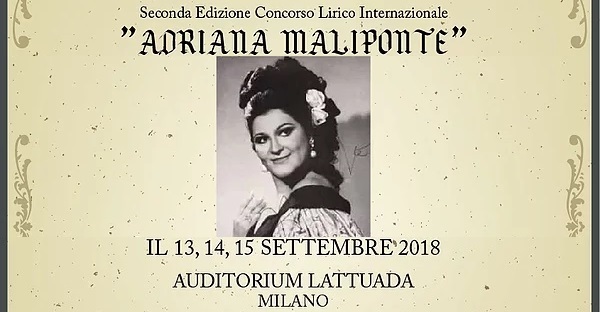 Abigaille determines to seize the throne (Salgo già del trono aurato / “I already ascend the [bloodstained] seat of the golden throne”). Zaccaria reads over the Tablets of Law (Vieni, o Levita / “Come, oh Levite! [Bring me the tables of the law]”), then goes to summon Fenena. A group of Levites accuse Ismaele of treachery. 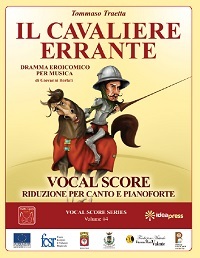 Zaccaria returns with Fenena and his sister Anna. Anna tells the Levites that Fenena has converted to Judaism, and urges them to forgive Ismaele. 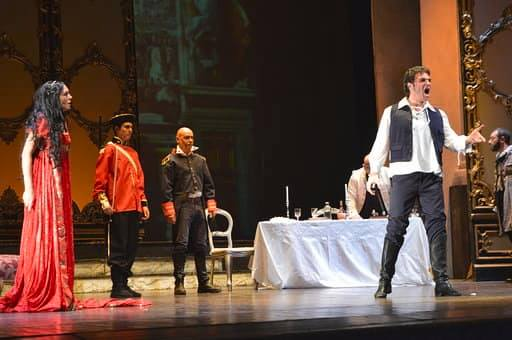 Abdallo, a soldier, announces the death of Nabucco and warns of the rebellion instigated by Abigaille. Abigaille enters with the High Priest of Baal and demands the crown from Fenena. 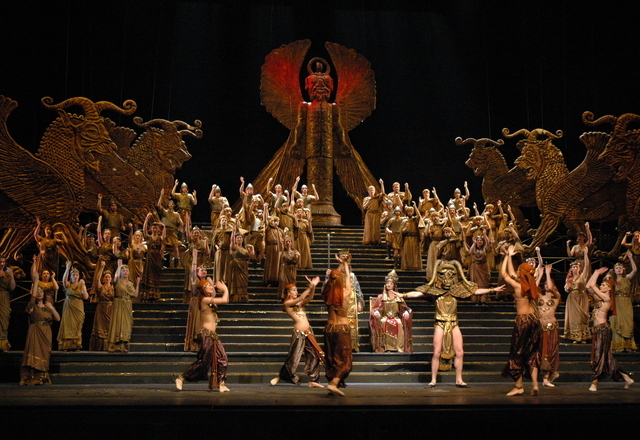 Unexpectedly, Nabucco himself enters; pushing through the crowd, he seizes the crown and declares himself not only king of the Babylonians but also their god. The high priest Zaccaria curses him and warns of divine vengeance; an incensed Nabucco in turn orders the death of the Israelites. Fenena reveals to him that she has embraced the Jewish religion and will share the Israelites’ fate. 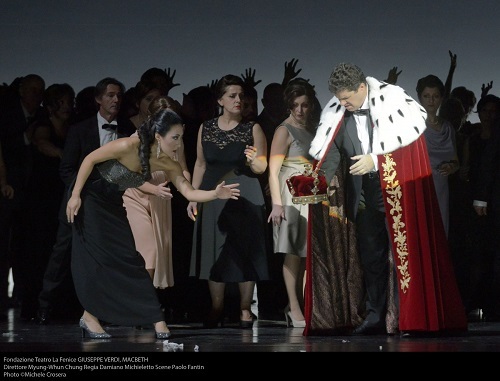 Nabucco is furious and repeats his conviction that he is now divine (Non son più re, son dio / “I am no longer King! I am God!”). There is a crash of thunder and Nabucco promptly loses his senses. The crown falls from his head and is picked up by Abigaille, who pronounces herself ruler of the Babylonians. Abigaille is now Queen of Babylon. The High Priest of Baal presents her with the death warrant for the Israelites, as well as for Fenena. 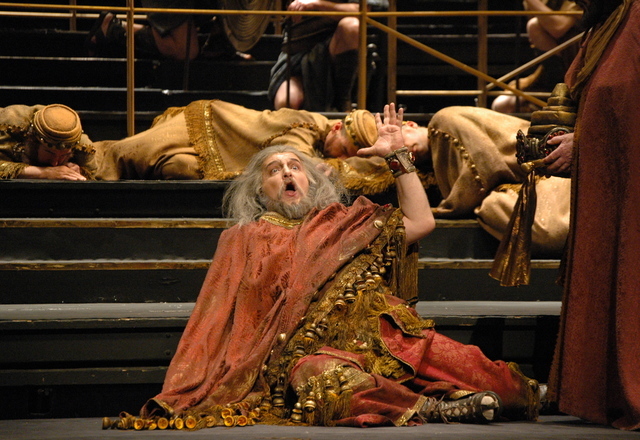 Nabucco, still insane, tries to reclaim the throne without success. Though his consent to the death warrant is no longer necessary, Abigaille tricks him into signing it. 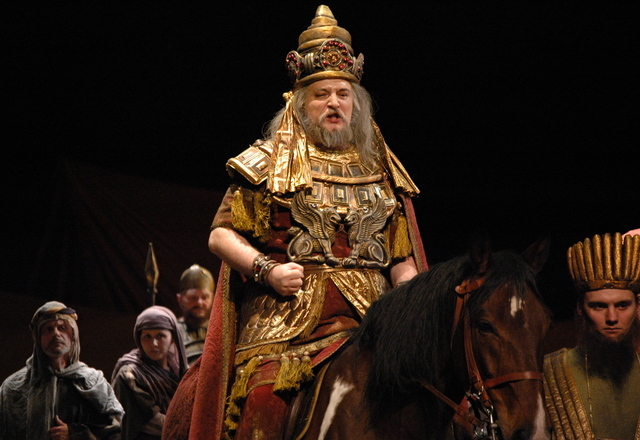 When Nabucco learns that he has consigned his (true) daughter to death, he is overcome with grief and anger. He tells Abigaille that he is not in fact her father and searches for the document evidencing her true origins as a slave. Abigaille mocks him, produces the document and tears it up. Realizing his powerlessness, Nabucco pleads for Fenena’s life (Oh di qual onta aggravasi questo mio crin canuto / “Oh, what shame must my old head suffer”). Abigaille is unmoved and orders Nabucco to leave her. The Israelites long for their homeland (Va pensiero, sull’ali dorate / “Fly thought on golden wings; [Fly and settle on the slopes and hills]”). The high priest Zaccaria once again exhorts them to have faith: God will destroy Babylon. The Israelites are inspired by his words. 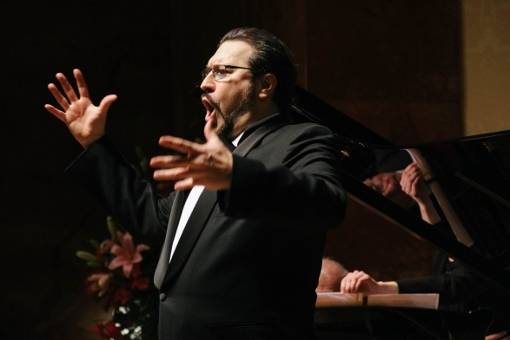 Nabucco awakens, still confused and raving. He sees Fenena in chains being taken to her death. In despair, he prays to the God of the Hebrews. He asks for forgiveness, and promises to rebuild the temple in Jerusalem and convert to Judaism if his prayers are answered (Dio di Giuda / “God of Judah! [The altar, your sacred Temple, shall rise again]”). Miraculously, his strength and reason are immediately restored. Abdallo and loyal soldiers enter to release him. 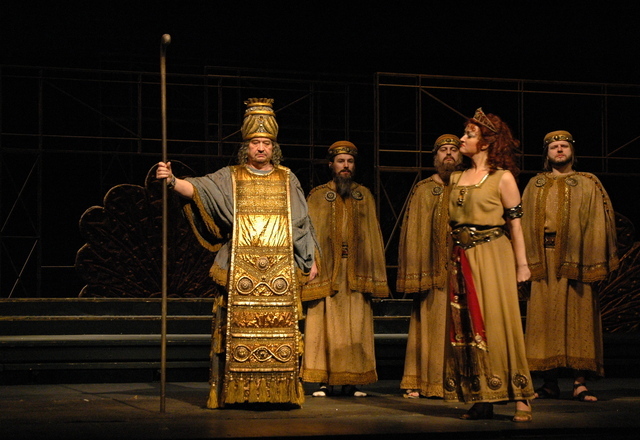 Nabucco resolves to rescue Fenena and the Israelites as well as to punish the traitors. Fenena and the Israelite prisoners are led in to be sacrificed (Va! La palma del martirio / “Go, win the palm of martyrdom”). Fenena serenely prepares for death. Nabucco rushes in with Abdallo and other soldiers. He declares that he will rebuild the Temple of Jerusalem and worship the God of the Israelites, ordering the destruction of the idol of Baal. At his word, the idol falls to the ground of its own accord and shatters into pieces. 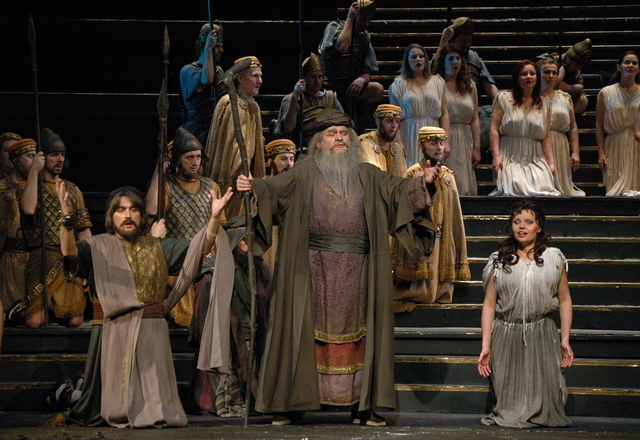 Nabucco tells the Israelites that they are now free and all join in praise of Jehovah. 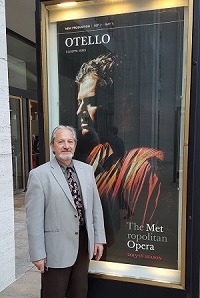 Zaccaria proclaims Nabucco the servant of God and king of kings. Abigaille enters, supported by soldiers. She has poisoned herself. She begs forgiveness of Fenena, prays for God’s mercy and dies. 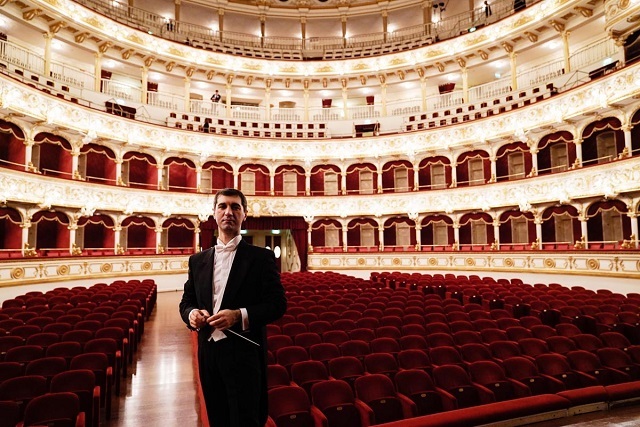 This entry was posted in OPera and tagged Babylonia, Giuseppe Verdi, Nabucco, Opera Narodowa, Poland. Bookmark the permalink.